The County President John Smith was honoured to have as guest at this years County Dinner the newly elected President of the English Golf Union Mr Norman Forrest who to his credit was in bonny Scotland on the morning of the dinner travelling by train to Bournemouth to be present at the well attended evening. The After Dinner Speaker for this year was Bob ’The Cat’ Bevan MBE a supreme athlete and not a bad after dinner speaker! 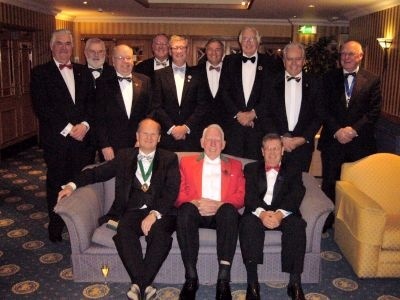 Our guests from around the counties were County Dinner 2009Mr Derek Hanson SWCGA, Dennis Longden MBE Somerset, Alf Palmer Devon, Maurice Widdows Gloucestershire, Malcolm Nixon Wiltshire, Mr Ian Burton Kent, Mr John Bury Sussex, Martin Christmas Surrey and Graham Binney Cornwall. The dinner was also attended by members from fifteen of our counties golf clubs along with the County Captain players and officials from the executive. 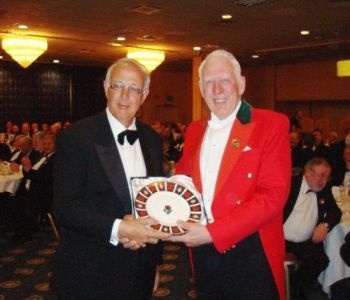 Mike Ford Captain Parkstone GC receiving the EGU Centenary plate from Norman Forrest President of the EGU. 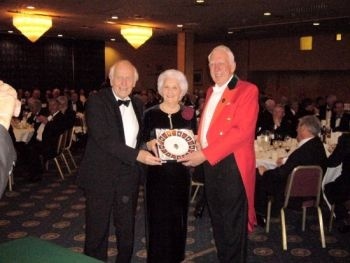 Weymouth members Isabel Hussey and Norman Grimshaw receiving the plate on behalf of Weymouth GC from Norman Forrest President of the EGU. We were then heartily entertained, firstly Norman Forrest who delivered in his normal easy style, followed by a some what nervous John Smith, John had no need to be nervous his speech was delivered eloquently, he touched on matters that are of concern to all in the trying days and months ahead. That just left the lean mean and athletic body of our guest speaker Bob ‘The Cat’ Bevan to step up to the microphone (or did it step up to him!) to entertain an attentive audience this he did with some sharp and entertaining humour. The President for what ever reason has requested at next year’s dinner the entertainer is seated on a table of his own!! We return to the Crown Hotel Blandford on Friday the 12 March next year so please make a note in your diary and I look forward to seeing you there. I have received numerous complaints over the food, please be assured I was as disappointed as you, I can only apologise, I will strive to ensure it does not happen again at future Dinners and ask you continue to support this great event where we have a chance to get together with friends in a jovial atmosphere.